I’ve made this pasta salad many times, and every time is quite different. This has cucumbers, tomatoes, sundried tomatoes, and feta cheese. I just use store bought Greek dressing, but jazzed it up with extra lemon juice for a nice twangy taste I also sprinkle crushed dried chilli peppers in it before eating. 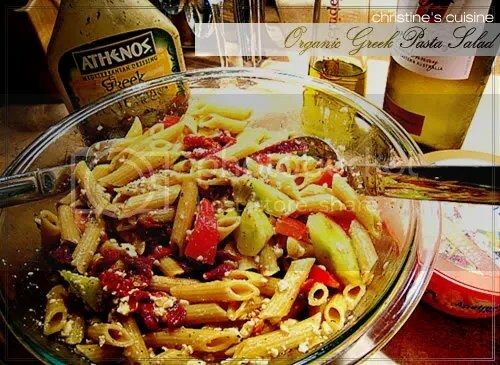 You can pre-toss the cucumbers, tomatoes, sundried tomatoes in extra virgin olive oil before adding in the pasta. Add the feta cheese last so that it doesn’t get melted when you add in the hot cooked pasta. This entry was posted in Italian and tagged food, pasta, salad. Bookmark the permalink.